There are new gaming peripherals coming out all the time. While some are better than others, what piques our interest normally lines up perfectly with our individual wants and needs. This means that more often than not, gaming accessories are targeting a specific group of gamers rather than making something that everyone can use, and doesn’t do too much in the way of improving the actual design of the mouse. 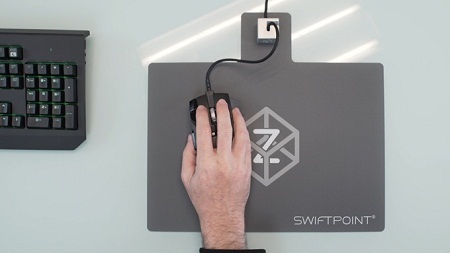 The company Swiftpoint made a mouse several years ago that did wonders for laptop users, but now they’ve set their sights to gaming, and have created The Z. This is a gaming mouse that has a world first; a mouse that can pivot, tilt, and roll, with a whole new way to press buttons. Not only are you going to have right and left click with a scroll wheel in between, but there are two side buttons, two finger buttons, two push/pull trigger buttons, two thumb buttons, and the pivot, tilt, and roll will add far more options. This mouse is capable of reading actions on the table as well as in the air for flight simulators, and the right and left click have two clicks, a soft and deep click, all of which you can assign. You will be the one configuring what constitutes a deep click, so don’t worry about being stuck with a setup that doesn’t work for you. This will cost you $149-159 while it’s in a Kickstarter campaign, and is certainly going to give you a lot of new aspects to add to your game. Of course, this also has tons of practical uses for power office workers and designers as well.